Paper Makeup Stamps: Wanna win a Shaela stamp plus a BLINGZ? Quixotic Paperie is hosting a challenge to comment on all of the design team blogs and you are entered to win this stamp and a jar of Shimmerz Blingz. So go HERE to get started and see a Shaela card not previewed here! Tee Hee! 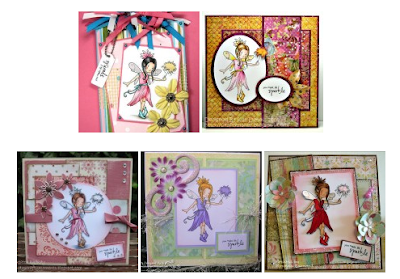 - Thanks Katie for posting our cards :) Isn't it fab how different they all look? How cool that you've blogged about us! Fame! Hehehe! Was lots of fun working with this Shaela fairy! thanks for showing our cards!! I loved that cute image! will definietely be using these cute images again! I love that image she is just to cute.. Love the cards to..